Jean arrived Saturday afternoon in Great Falls. We did lunch and headed for Lewistown, MT for a bed and breakfast there. It was about 5 miles outside of Lewistown on 20 acres. It was very quiet. After a great breakfast Sunday morning of fresh raspberries crepes, link sausage, scrambled eggs, juice and tea we were off. 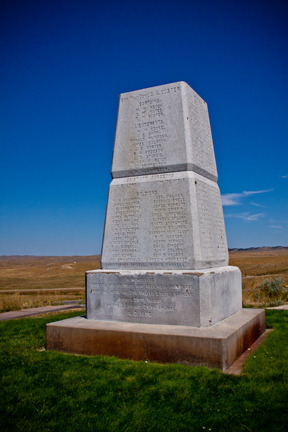 First stop was the site of the Battle of Little Bighorn or as it is also known, Custer’s Last Stand. In 1868 a treaty was signed with the Lakota, Cheyenne and other tribes of the Great Plains to move the Indians to a large portion of eastern Wyoming as a permanent reservation. In 1874, gold was discovered in the Black Hills, the heart of the new Indian reservation. When word spread of the gold, thousands of gold seekers swarmed the area in violation of the treaty. Attempts were made to buy back the land to know avail and Indians started leaving the reservation to conduct raids against the settlers. When the Indians refused to obey orders to move back to the reservations, the army was sent in to resolve the issue. In June 1876, three groups of troops departed from three different locations to converge on a village of 8000 Indians including about 1500-2000 warriors. Due to various problems, the three military groups did not connect. One of the groups of less than 50 soldiers led by Lt. Col. George A. Custer, were surrounded by several hundred warriors. Custer ordered his men to shoot their horses and use them a shields from the Indians to no avail. These markers show where the soldiers fell on the Last Stand Hill. 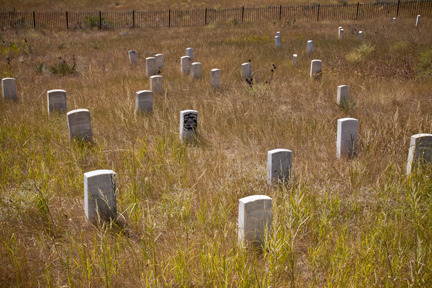 Custer’s marker is in the center. 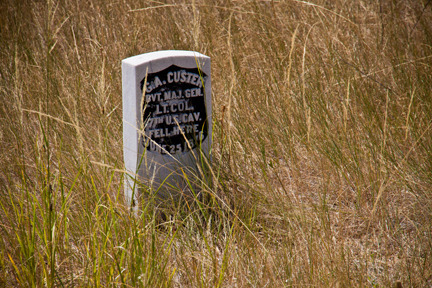 One of the other groups arrived after Custer’s contigent were killed. They buried them in shallow graves and moved on. In l877, the 11 officers and two civilians killed here were removed to eastern cemeteries. Custer was reinterred at the U. S. Military Academy at West Point. In 1881, the remains of the enlisted men were buried in a mass grave beneath this memorial. Sitting Bull and Crazy Horse, two of the primary chiefs that were involved with the Indian, were killed later in separate incidents for resisting arrest. Jean and I moved on to Gillette, Wyoming. Today, we were at Mt. Rushmore near Keystone, South Dakota. This is the Avenue of Flags. 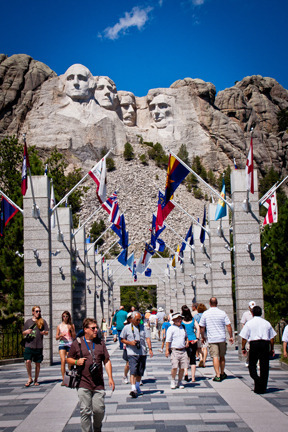 The 56 flags represent the states, districts, commonwealths and territories of the U.S. When the original concept for Mt. 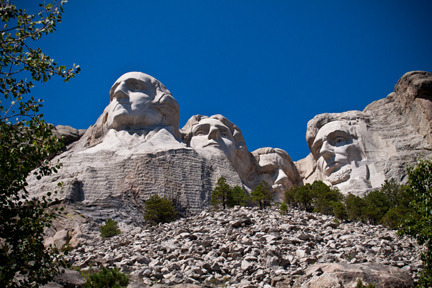 Rushmore was conceived it was to be sculptures of numerous significant U.S. citizens. The carvings were to be done in spires of Black Hills rock. When the sculptor, Gutzon Borglum, was selected, he determined that the spires would not work. They were too soft. He proposed using the face of the mountain itself. The idea for these sculptures were not without controversy. There were many local people who felt that it would deface the mountain. But congressional approval was secured and money raised. It was decided to base the sculptures on Birth, Expansion, Development and Preservation. Washington for Birth, our first president. Thomas Jefferson for Expansion, the Louisiana Purchase. Theodore Roosevelt for Developement, the Panama Canal, Trust Buster and National Parks. Lincoln for Preservation, saving the union during the Civil War. The project was begun in 1927 and completed in 1941…a period of 14 years but the actual work took only 6 plus years. It was stalled several times to raise additional money and overcome objections along the way. The total cost was under a million dollars and involved 400 workers. Each face is 60 ft. high and each eye is 11 ft. wide. 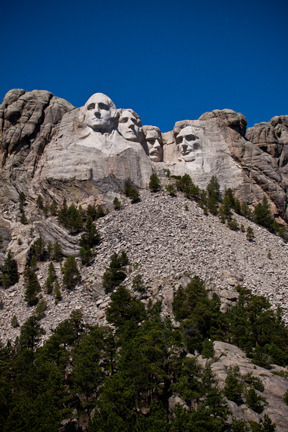 Washington’s nose is 21 feet long and the other’s are 20 ft. Initially, the plan was not to use dynomite but rather, drills. After a very short time, it was determined that this method would take far to long and dynomite became the normal method of carving with the smoothing being done with drills and chisels. I’ve sent my special email on Alaska to about a third of you. I’m still waiting to hear from the rest as to whether you want me to email it to you. Those that have received it so far have indicated it takes about 8-10 minutes to download and only one system rejected it as too large for it. That, and it can’t be sent to Interstate Batteries email system.